The club has a new anemometer which replaces the long-serving but increasingly decrepit old one. A key feature of the new one is that it is bluetooth enabled so you can download an app to your Android or Apple smart phone and see what the wind is doing from anywhere within a 50+ metre radius of the clubhouse. 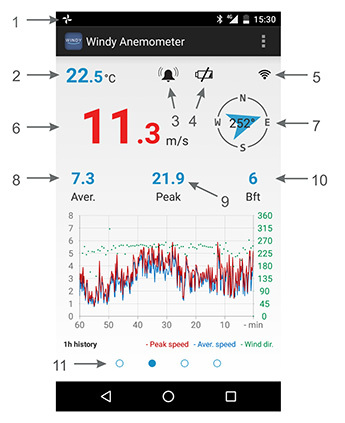 The "Windy anemometer" app on an Android smart phone. Note that the Apple iOS version does not have all the features of the Android version. Application activity icon indicates application's activity. Air temperature - data from sensor's built-in temperature sensor. Alarm icon shows up when wind speed alarm is turned on and set. Low battery icon shows up when battery in sensor is low and needs replacement. Signal icon every time data is received from sensor, icon flashes. Current speed in units set in settings. When wind speed exceeds alarm value, numbers become red and flashes. Wind rose - wind direction graphical and numerical display. Note that the arrow points in the direction the wind is going but the numerical reading is for where the wind comes from. Hence a south-westerly might read 225˚ but the arrow will point to the north east. Average speed in last 1, 3 or 10 minutes (adjustable in settings). Peak speed - maximum wind speed. Can be reset with long/double tap on peak speed value or label. Speed in Bft (Beaufort) scale. Indicates which graph is displayed - wind 10min, 1h, 12h or temperature 24h. Swipe left or right to change graph. More details are available on the NAVIS anemometers site. And if anybody is interested you can see the full specification here.